Lug nut covers may not sound like much, but they’re actually a very exciting part of outfitting your rig. 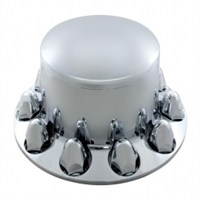 Spiked lug nut covers or other styles of wheel nut covers can give your vehicle a whole new look. There’s no need to drive down the road with ho-hum wheels when you can turn them into attention-getters with a set of high-quality, long-lasting and sharp-looking lug nut covers. 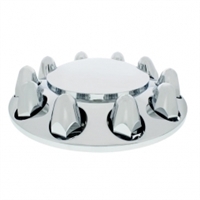 If you’re in the market for lug nut covers, Strickland's has them all: plastic lug nut covers, chrome plated, chrome plastic, stainless steel, bullets, warheads, spikes, super spikes, cylinders, stilettos, reflectors, towers, domes, pointed, push-on, threaded, and more. Items are available individually or in packs, depending on the product. Either way, they won’t bust your budget — but they will make your rig look sharper than ever. Picking the right wheel nut covers is easy. By far, the most common lug nut covers for semi trucks are 1 inch to ½ inch and 33 millimeter. Place a 33-millimeter socket over one of your current lug nuts. If it fits snugly, you need 33-millimeter lug nut covers. We said it was easy! By the way — if you don’t have a 33-millimeter socket handy, use a 1-inch-to-½-inch socket. If it’s too loose, you need a 33-millimeter lug nut cover. If it fits snugly, 1 inch to ½ inch is your size. In terms of push-on or threaded, determining which you need is just as simple. If you have less than ½ inch of thread, you will need a push-on wheel nut cover. More than ½ inch, thread-on will work fine. Great looking lug nut covers can turn a plain looking rig into a head turner — and there’s no other truck accessory that can do that at such a low cost. 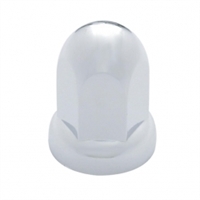 All of our semi lug nut covers are high quality, warrantied, and made by leading manufacturers. They are built to last, able to withstand rugged driving conditions day in and day out. For accessories, our 11-inch lug nut cover socket for plastic lug nuts facilitates the installation and removal of chrome plastic lug nut covers — a tool every pro should have in the toolkit. 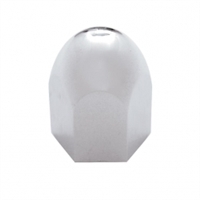 We also have a heavy-duty steel, zinc-plated, vinyl-coated lug nut cover tool for 1-to-½-inch and 33-millimeter flat nut covers. It will last for years! Need special size lug nut covers, or still not sure what you want? Contact us any time. Our customer service team is experienced in the trucking industry and eager to help you figure it out. Speaking of customer service, that is one of the most important things there is to know about Strickland's. When you work with us, you will talk to people who are passionate about trucks, not somebody half way around the world who’s never even driven one. Our goal is your complete satisfaction, and we make that happen by offering top-quality products, huge inventories, knowledgeable sales support, careful packaging, fast shipping and strong warranties.